This year has been the Chinese Year of the Monkey. I am sure many feel, as I do, that it has been quite trying in many ways. The monkey is lively, clever, but also mischievous and cheeky, prone to playing naughty pranks and causing disorder before running away, leaving others to their fate. A year under the auspices of this zodiac was bound to be chaotic. In 2016 we have experienced the deaths of many the world holds dear. This includes major international political icons such as Fidel Castro and Muhammad Ali, cultural ones such as David Bowie, Sir George Martin and Prince. We have lost experts in many fields such as astronauts John Glenn and Eugen Cernan, pop musicians Paul Kantner (Jefferson Airplane) and Glenn Frey (The Eagles), and Pierre Boulez the renown conductor of classical music. We have lost many who reminded us how far we have come in diversity and inclusiveness, such as architect Zaha Hadid, transgender actress Alexis Arquette, writer and Nobel winner Elie Wiesel, writer Joseph Medicine Crow – last of his tribe. Excellent actors loved for their craft, Alan Rickman and Gene Wilder, have left us. Those who became part of fictional classics that have acted as global beacons in dark times have also left us, such as Fritz Weaver (DS9), Jerry Doyle (Babylon 5), Miguel Ferrer (Robocop). It is hard to accept the demise of cinema’s astromech droid, R2-D2’s motion actor. Ron Glass’ death is immensely sadder than Shepherd Book’s fictional one in Firefly. Just when we need to remember to sing in the rain, we lost Debbie Reynolds. It is hard for generations of geeks to move forwards in these difficult times without the shining hope that Princess Leia has become. I also lost two very dear family members, one of whom passed away very suddenly, last week. In 2016 we have seen national and global politics take major turns that led us to seriously doubt our civilizational progress, as those foundations of progress such as diversity, multiculturalism, tolerance, gender equality, were repeatedly attacked and undermined not only in the political arena but in a way that threatened and endangered the safety and security of many lives. However, hope is hard to extinguish, as the much-needed story of Rogue One, released before Christmas, reminded us. The phenomenal Trump inaugural protests, and Women’s March across seven continents, in which so many groups banded together to support each other, encourage us not to give up, sending out positive messages around the world that we can still change things. There have definitely been flecks of light in the darkness of 2016. For instance, Hao Jingfang’s winning of Best Novelette at the Hugo Awards not only raised the global profile again for Chinese science fiction, after Liu Cixin’s success the previous year, but also won some recognition for female sci-fi writers, much underrated both outside and within China. Thanks to years of effort of Chinese conservationists, pandas are now a “vulnerable species”, rather than endangered. Over the last year, my Chinese culture work has also gathered momentum and made significant progress. I’d like to thank the following people for giving me the opportunity to explain Chinese culture to Western audiences. Thank you to London Graphic Network for inviting me to write a column on Chinese manhua and Chinese culture in comics. Thank you to Michelle at Red Dragonfly Production for giving me the opportunity to preview their fantastic and unique rendition of Diao Chan’s story. Thank you to all those who facilitated and attended the premier of my “Chinese Don’t Do Sci-Fi? !” talk at Nine Worlds. Thank you to Yen Ooi, writer and consultant, for inviting me to join her and founder of Del-Rey Michael Rowley on her Chinese Sci-Fi discussion panel. Thank you to my translation partner SF Comet for the interview on the state of Chinese sci-fi that supplemented this panel. Thank you to JD Wasabi Studios for continuing with their visual novel inspired by Asian horror “Hungry Whispers”, it was my pleasure to be involved again in this project. Thank you to those who are helping me in getting my first non-fiction book specifically on Chinese culture published. Thank you to Dave Haysom and Paper Republic for helping me bring out my translation as part of their Reads series. Thank you to Tang Fei for writing such unique and wonderful fiction. Thank you to the film department and Confucius Institute at QMUL, Professor Eugene Doyenne in particular, for introducing me as a speaker for their current and forthcoming Chinese culture programme. Thank you to all my friends on social media and those who have written to discuss specific aspects of Chinese culture with me, for your support and interest. 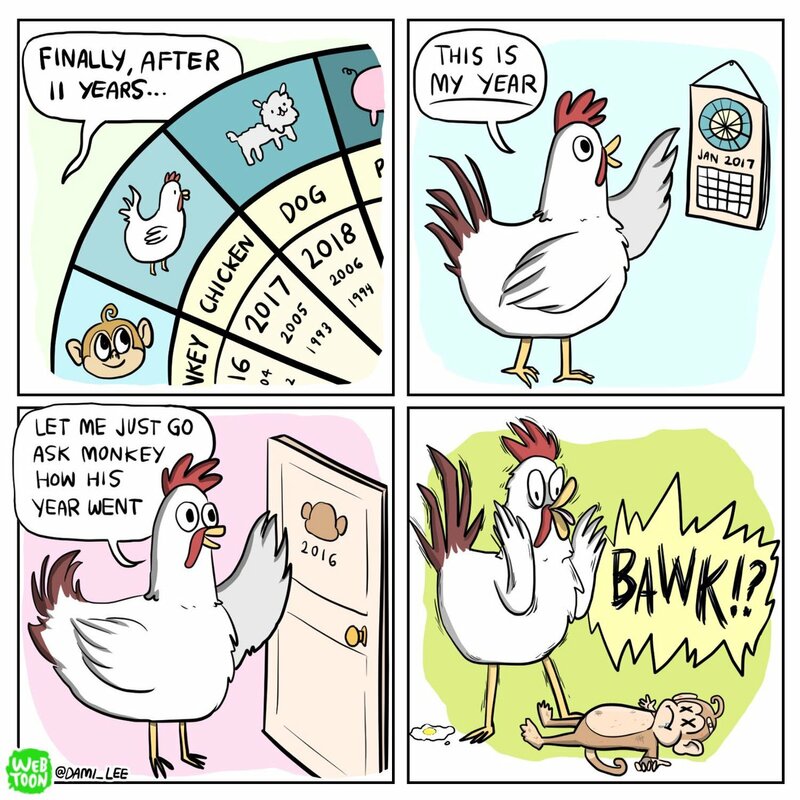 It is only a week now before the end of the Year of the Monkey, and the start of the Year of the Rooster. I hope there won’t be much more chaos to come. The Rooster is said to be loyal, brave, capable and persevering. 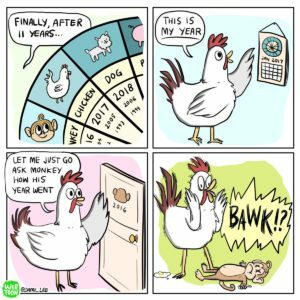 As Rooster myself, I am determined to make 2017 a good year. Through my writing, translation and talks I will continue to further understanding between different cultures, uphold multiculturalism, diversity and tolerance of all kinds, and bring you yet more interesting and entertaining content from the amazing world of past and contemporary China.